The $1549 (as of 11/07/2012) Xerox Phaser 6700/DN produces some of the smoothest photos you’ll see from a workgroup color laser printer, albeit a little orangey until you tweak the palette. It's also fast, and it offers lots of paper capacity. The price of supplies is very inexpensive, with the price per four-color page as low as 8.6 cents (with high-yield supplies). At 93 pounds, the Phaser 6700/DN is a hefty, solidly constructed printer with a high monthly duty cycle of 120,000 pages. Paper handling features include automatic duplexing; a 550-sheet, bottom-mounted main tray, and a 150-sheet multi-purpose tray that folds out from the side. You can add more capacity with auxiliary 550-sheet ($399) or 1,100-sheet ($799) trays. There's also a stacking/stapling finisher available ($899). The Phaser 6700/DN is one of several related configurations: the $1349 Phaser 6700/N without duplexing, the $1899 Phaser 6700/DT with the 1,100 sheet tray standard, and the $2899 Phaser 6700/DX with maximum paper capacity (three trays) standard. (A $200 rebate in effect with all Phaser 6700 models through the end of 2012 is not reflected in the prices above.) One year of onsite service and warranty is included in the price, but it seems a bit skimpy for a product this expensive. Xerox offers a wide variety of onsite service plans for up to four years. Supply costs for the Phaser 6700/DN are much cheaper than average. The 5,000-page, $180 standard cyan, magenta, and yellow cartridges work out to about 3.6 cents per page (cpp) per color. The standard black cartridge is $140 and lasts for 7,100 pages, or 2 cpp. The $295, 12,000-page, high-capacity colors drop the per-page cost slightly to 2.5 cents per color, while the $216, 18,000-page black cartridge works out to 1.2 cpp. All told, you're paying about 8.6 cents per four-color page with the high-capacity supplies, and a hair under 13 cents with the less capacious cartridges. Other supplies include 50,000-page imaging units that cost $100 for each color and $80 for the black. A 25,000-page waste catch costs $30. All these combine to add about 0.9 cents total to every page (after the original consumables are exhausted). 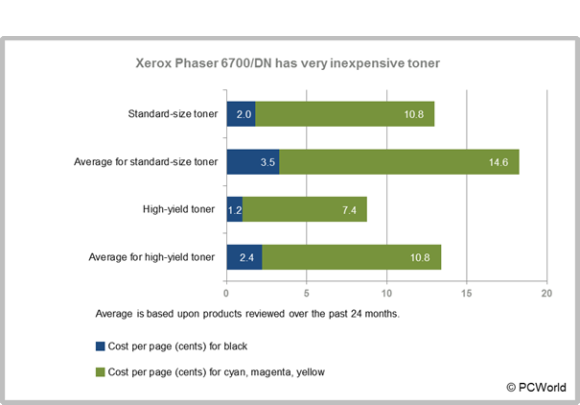 The Xerox Phaser 6700/DN has very cheap toner. The Phaser 6700/DN also has speed on its side. Using true Adobe PostScript as its default printer language (it also emulates PCL 5e and PCL 6), monochrome pages print at swift 22 per minute (ppm) on the PC and a best-in-class 25.7 ppm on the Mac. Photo speeds were more moderate: A full-page color photo printed at a medium-fast rate of 1.6 ppm to glossy laser paper, while snapshot-size photos arrived at 3 per minute on plain paper and 1.5 per minute to glossy paper. Color lasers tend to struggle with photos. The Phaser 6700/DN’s 2400-by-1200-dpi resolution no doubt contributed to the smooth look of its photos. The default color palette erred excessively on the side of orange, however, which made some images look vivid—and others, especially fleshtones, unnatural. Fortunately, there are loads of color settings to futz with. The Xerox Phaser 6700/DN is a solidly built, large-workgroup printer with the ability to increase capacity with your needs. It would be nice if the color required less tweaking and the warranty lasted longer, but it's fast and produces excellent business documents. Among similarly priced competitors, theDell 5130cdn and Lexmark c792de are both faster and somewhat better equipped, but the Lexmark has pricier toner. Xerox's Phaser 6700/DN produces nice output and does so quickly, but the single-year warranty is disappointing.